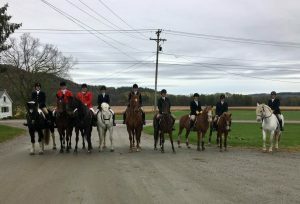 Foxhunting with Green Mountain Hounds is about the best riding bargain in Vermont – or anywhere else for that matter! Hounds went out about 40 times last season, and the hunt went out four more times to meets with other hunts. All prices include voluntary $35 for MFHA membership. The Masters of Fox Hounds Association is the umbrella organization for mounted foxhunting in North America. Participation and support is important for the continued viability of our sport. When included with your Green Mountain membership we will take care of it for you, and among other privileges, you will receive the beautiful magazine Covertside quarterly. Juniors who participate in at least five hunts are eligible for a free subscription through the Fairly Hunted Award.